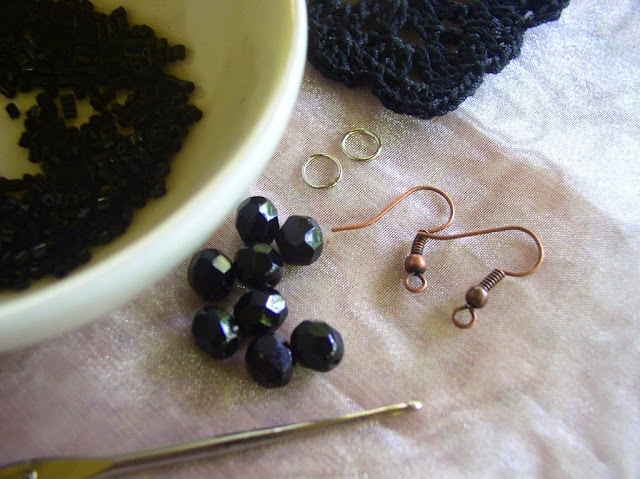 With your favourite crochet motif, you can make beautiful jewellery by adding beading into your repertoire of skills. 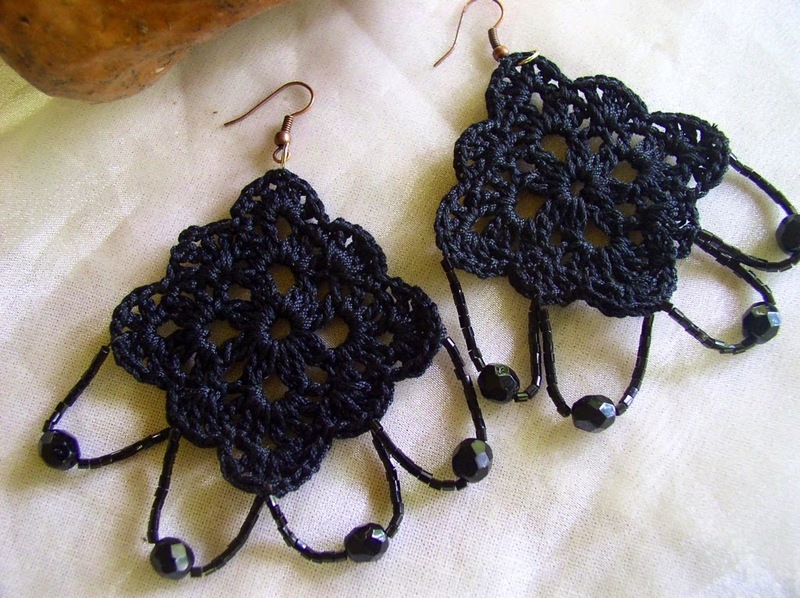 Here is one example, to make a set of earrings and pendant. You will need some earring wires and jump rings, a larger ring for the pendant. You will also need a string for the pendant. I use black synthetic leather. I think that black satin or velvet lace would be nice too. As for the beads, you must get only the finest quality beads. 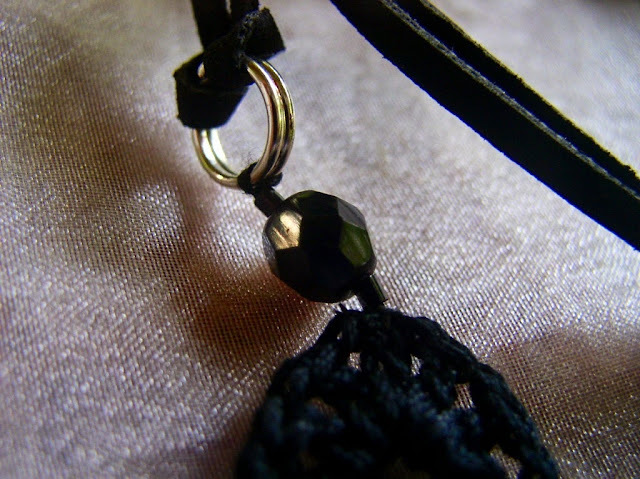 I got beautiful black cut beads from Japan and antique black faceted glass beads. 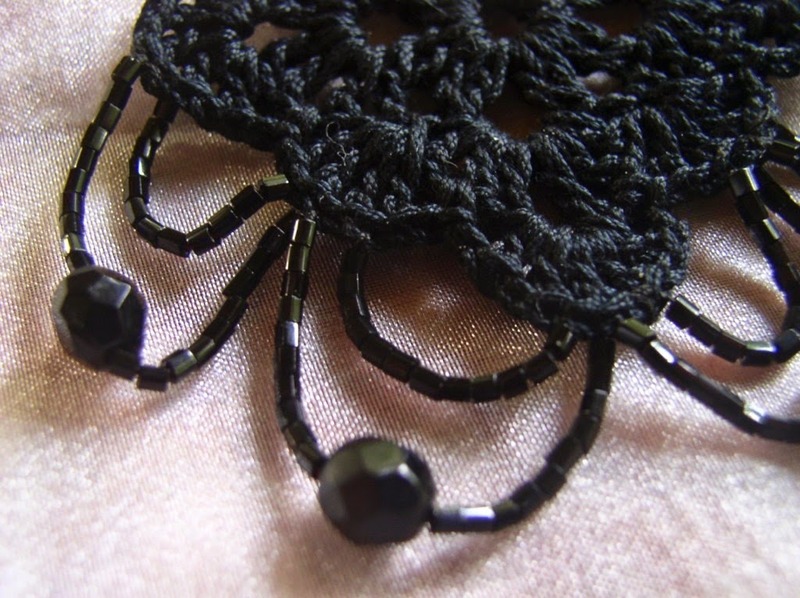 These beads must sparkle against the black lace thread. 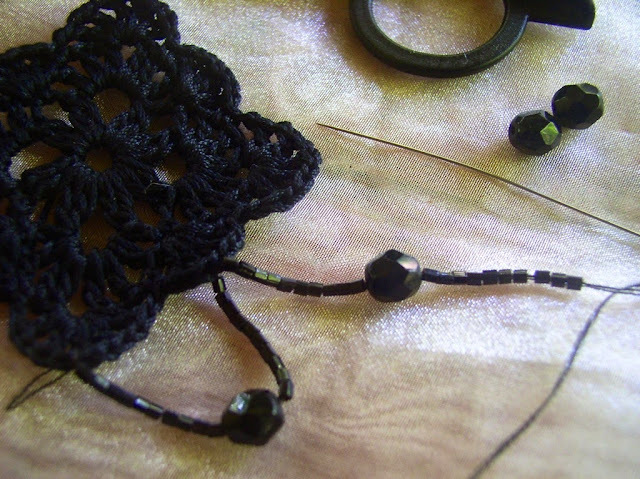 I use a beading needle and black polyester thread for beading. While I have no difficulty with it, some people can have a really hard time getting the thread through the tiny eye of the needle. In this case you may consider using a flexible beading needle. This has a large eye that collapses when you pass the tiny beads over it. The thread you use is also crucial. The jewellery set I made is all in black. It can be difficulty working with black thread because you can’t see the stitches. I find that it is easier to work with thread that has a sheen as this makes the stitches more visible. 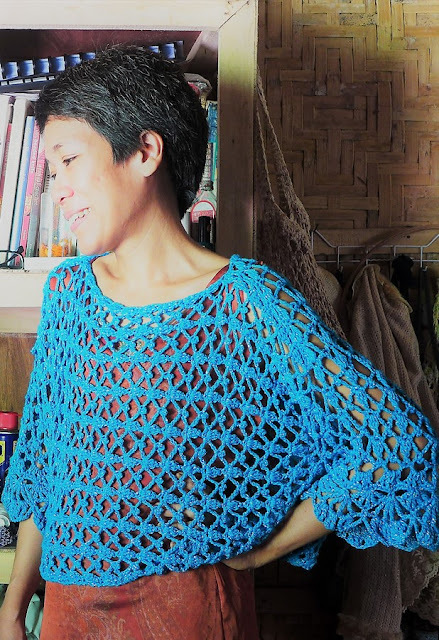 For this project I used Hamanaka Lacy Crochet cotton thread size 8 from Japan. I tried two other brands of thread that are locally manufactured, Monaco and Cannon. Unfortunately, these were of less quality than Hamanaka. These threads did not have the same shine and also had more tendency to pill because they are not plied tightly. It seems that tight plying makes for a stronger and more rigid thread. However, when cotton thread is starched, this will give the piece some strength and shine. I would recommend starching for all crochet jewellery. The motif is a beautiful lacy square. Here is the pattern. Ch 6. Sl sth in first ch to make a ring. Rnd 1: Ch 3, dc in ring, ch 3, keeping last loop of each stitch on hook, make 2 double crochet in ring, yarn over and pull loop through all 3 loops on hook (2dc cluster made), *ch 4, 2dc cluster in ring, ch 3, 2dc cluster in ring, repeat from * twice, ch 4, sl st in top of 3-ch. Rnd 2: Sl st in 3-ch sp, ch 1, sc in same ch sp, *ch 1, in next 4-ch sp make (dc, ch 1, dc, ch 1, dc, ch 3, dc, ch 1, dc, ch 1, dc, ch 1), sc in next 3-ch sp, rep fr * 3 more times, but at the last repeat, omit the last sc. Instead, make sl st in first ch made at the beginning of the round to join. Rnd 3: Ch 4, in sc make (dc, ch 1, dc), sk next ch sp, sc in next ch sp, in 3-ch sp make ([ch 1, dc] 5 times), ch 1, sk next ch-sp, sc in next ch-sp, *in next sc make (dc, ch 1, dc, ch 1, dc, ch 1, dc), sk next ch-sp, sc in next ch-sp, in 3-ch sp make ([ch 1, dc] 5 times), ch 1, sk next ch-sp, sc in next ch-sp, rep fr * two more times. Sk next ch-sp, dc in sl st at base of first 4-ch made, ch 1, sl st in third ch of same 4- ch to join. Fasten off. Lay crocheted lace flat on a few layers of clean cloth. Spray or dab with commercial fabric stiffener. You can also prepare your own fabric stiffener as follows: dissolve 1 tsp cornstarch in one cup of water in a saucepan. Add a tsp of vinegar or salt as preservative. Bring to a gentle boil stirring constantly. Let cool and pour into a spray bottle. You can also use a brush to apply the starch solution instead of spraying. 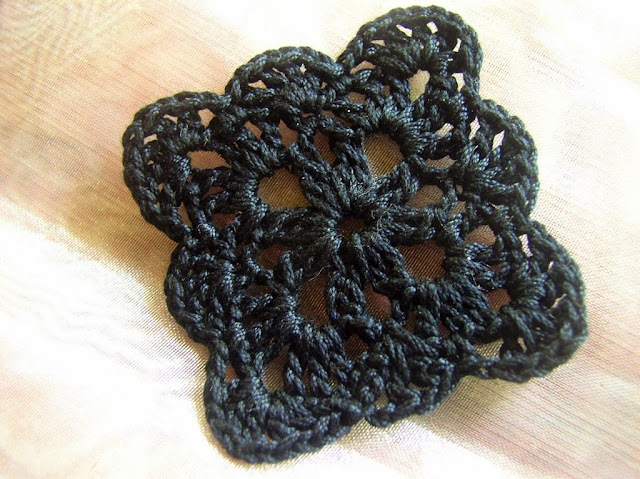 While wet, use your fingers to shape the crocheted lace, flatten tips and corners that stick up. When done, let the piece dry completely for at least two to three days. Using the photographs as guide, sew on the beads along the two bottom edge of the motifs. For the earring, the loops are made up of a larger glass bead with 10 cut beads on each side. For the pendant, the smaller inner loops are made up of 10 cut beads. I love how these earrings and pendant turned out. I especially like to wear the pendant close to the neck, like a loose choker. 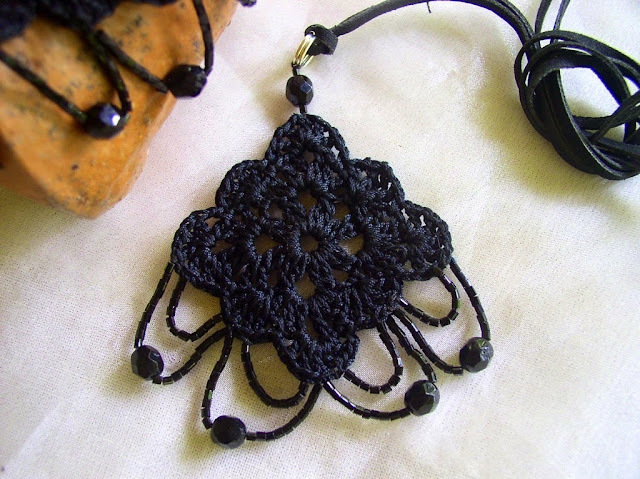 With your favourite motifs, you can make beautiful crochet jewellery by embellishing with the best quality beads. Make these for yourself, as gifts or to sell in your handmade shop.